It's that time! Be prepared to 'walk' your way from link to link to all the blogs participating in the Blogger Zombie Walk and get more zombie stuff in one day than you could possibly imagine (link list below). All the blogs have different and unique bends on the zombie genre for this event - zombie recipes, zombie reviews, zombie giveaways, zombie poems, zombie cartoons, and much more. When you click on a link below, you could then use their link list to click to other blogs and go through them all. As part of the Blogger Zombie Walk, I'll be giving away a package containing the books The Strangers Outside and Zombie Cupcakes. To have a chance at winning, do one or more of the following and post a comment below about each action you took. Each comment will count as a separate entry so your chances at winning increase. Contest is open worldwide! But hurry - the giveaway ends October 7. New follower? Let me know in a comment and I will follow you back. A frightening mix between The Fog and The Strangers... In the short story The Strangers Outside, two sisters return to their remote holiday cottage after a day at the seaside. But little do they know they're being surrounded. Soon after their arrival, the girls will come face to face with THE STRANGERS OUTSIDE. When the assailants make their intentions known, things take a shockingly terrible turn and an intense battle for survival will begin. I followed your blog does this mean I'm entered into your contest? A Zombie walk? How interesting! Thanks for inviting me to join in the fun. 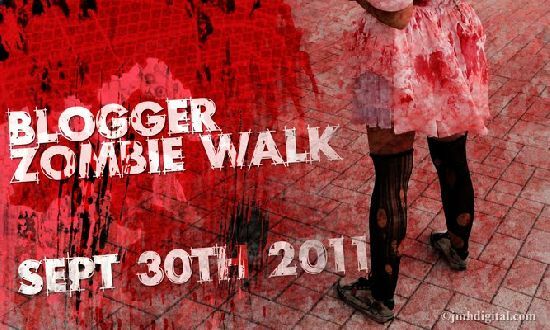 Would love to participate in the blogger zombie walk giveaway. I'm a gfc follower (lelijkeyvette@gmail.com). OMG! The Fog is one of my favorite movies! A new horror book to read = awesome! Thanks for visiting my blog! I'm now following you! I follow you on GFC and would love to be entered into the contest. Is there really a zombie walk, that sounds like so much fun! I am a new follower and I am uber excited about your literary giveaway!! I LOVE books almost as much as Zombies love brains! Stopping by from the blog hop and saw that I was already following thru GFC and Facebook but not on RSS Reader. So today I followed on RSS Reader. I would love a follow back on whatever you haven't followed on. Thanks so much when you come over and have a great weekend. New follower! Love your blog and very happy to be following you on GFC. OMG - you weren't kidding...I would LOVE that cupcake book =) Following!! Thanks for stopping by my blog too! found you on the blog hop, new follower, would love a follow back! Zombilicious! You've got another new Follower! Fantastic post! I am now a follower and tweeted your post. Great post...and my thanks for the awesome giveaway. My daughter loves to bake and is already drooling over the zombie cupcakes! I'm a GFC follower and I tweeted your blog! New follower. Come visit me over at Livre De Amour-Books of Love Blog. I really like the idea of this hop. Shared this zombie giveaway on Facebook. Hope I win. New follower. Thanks for stopping by my site and for the great giveaway! Fun stuff. Yummy looking c-cakes. Fab giveaway! I just followed your blog! Edible maggots... delicious!! I have a book review blog. I have to check out The Strangers Outside. It sounds awesome! 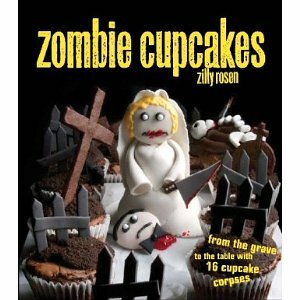 I collect cookbooks so I will also be looking into Zombie Cupcakes. We love zombies. I love the cupcakes cover. New follower. I follow GFC Lisa thanks and my sister loves Zombies maybe I should give them a try. lisapeters at yahoo dot com I forgot that. Hi! I'm a new GFC follower and I would love to win this mucho awesome giveaway!! A zombie walk sounds like fun. It reminds me of a shirt I saw at the store that I got for my son. It says "That is not a zombie, it is just my sister". It cracked me up, my daughter did not think it was funny. I am a new follower and have shared on my facebook page. The Music Balloon makes compact and stylish balloon shaped speakers which can be used as travel iPod speakers and Portable USB Speakers for your iPod. I'm following your blog. Thank you for hosting such a fantastic giveaway. stopping in with Say HI SundayHop- and following =) love the Zombie Cupcake book!! I want to participate in the giveaway. I shared on Facebook. p.s. Debs Dealz and I host a Monday Madness blog hop. Hop on over tomorrow and link up your blog. I love the blogger zombie walk and the giveaway of zombie books. Old GFC follower. National Pancakes Walk with a few zombies here and there. Be ready there are hungry! I follow on GFC as Alex Corbi. I shared the Blogger Zombie Walk on Facebook. Fun giveaway, I am a new follower - found you on book blogs. How fun, I already follow you via GFC. Zombie blogger walk? I love it! New follower. Hi I am following you via GFC, I found your contest from Just Another Hat (Low Entries). I love this giveaway, very cool! I just started my blog not long ago and have my first giveaway up, check it out, become a friend through GFC if you'd like! What a great giveaway! I would love to read both of your books! I mentioned your giveaway on facebook! And I'm a follower of your blog too! I love, love, love the zombie cupcakes book. My dd dance team was zombies for a dance competition and they got bad looks everywhere we went but it was kinda fun! I'm a new follower! http://angela-mommytimeout.blogspot.com. What a great giveaway! New follower on GFC from the blog hop! I follow via GFC. Super excited about those books! This sounds like a ton of fun! New follower! Love this giveaway. Super cool giveaway idea! Stopping by from the Awesome Alexa Mavens Blog Hop! Hi! I am a new follower from the hop. Please enter me in the zombie giveaway. This has to be the most unique things I've ever seen on a blog. Love it. Thanks for joining the blog hop I host at November Sunflower! You're tugging on my heartstrings! Zombies were the only "movie monster" that ever really scared me growing up! Thanks for the giveaway.